Magnets Reveal Hidden Cereal Ingredient! Many cereals are fortified with added iron, one of many necessary vitamins and minerals. These items are added to the mix when the cereal is are made, so it is a bit like taking your vitamin with the cereal. Since iron is attracted to magnets, finding it can be an instructive science experiment. We like it because we’re experimenting with new ideas using everyday stuff that most people are already familiar with. If you're using strong magnets to try this experiment with kids, be sure to include adult supervision. Strong magnets are not toys! Food that is fortified has vitamins and minerals added to it for their health benefits. Fortified cereals are a well known example. While there are arguments for and against it, foritification has definitely addressed a number of large-scale, across-the-population epidemics. A well-known example is iodized salt, which was introduced in 1924. Adding iodine to salt has reduced Idodine Deficiency Disorder (IDD), occurence of mental retardation, hypothyroidism and goiter. Another example is the addition of Vitamin D to milk, margarine and cereals. This has reduced bone deformations, rickets, and other health problems associated with Vitamin D deficiencies. These things have been working for so long, we're no longer even familiar with some of the once common diseases they have prevented. For the record, the iron in your cereal isn’t really hidden – Iron is listed right on the box as an added ingredient. How much iron is in there? 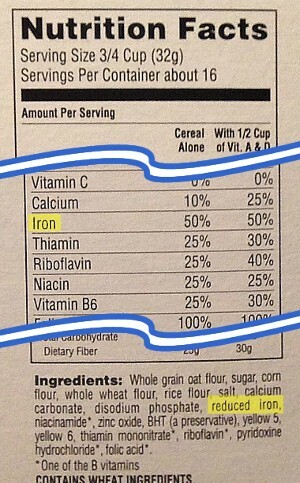 In one serving of cereal, there is a pretty tiny amount of iron added. How much is there? Let’s see if we can make an educated guess. The side of that Life cereal box says that one serving contains 50% of the daily requirement. How much is that? Well, what’s recommended for you depends on your age and gender. According to this source, it can vary from about 8 to 18 mg (milligrams) per day. We’re not sure what number the cereal box is basing its numbers on, but it’s probably somewhere in this range. How much iron is 8-18 mg? That’s hard to visualize. We don’t deal with milligrams enough in our daily lives to be able to picture that. If it were a solid cube of raw iron, how big would it be? If our math is right, we’re figuring it would be a cube of iron that is about 1mm square. That’s tiny! Of course, in the cereal this iron is ground into a find dust and spread throughout. Let’s see if we can find it hidden in there. 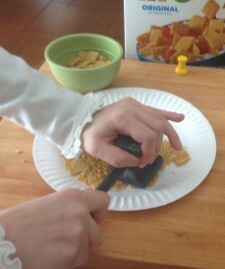 As a first try, we simply rubbed the end of a magnet around in the crushed cereal. Sure enough, some of the cereal stuck to the edges of the magnet. Since that's where the magnetic field is strongest, it makes sense that it sticks there. We found that a few pieces of cereal dust stuck to the edges of the XLTK-YEL magnetic thumbtack and the B666 block magnets we tested with. There’s nothing special about using those two blocks – we just had them handy at home from a TIN1 sample pack of magnets. 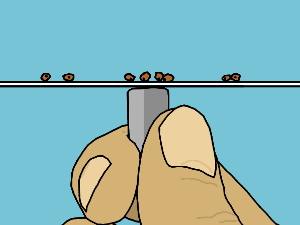 We also suggest simple cylinder magnets like the D6C or strong D8C magnets for this sort of check. We also were successful in seeing evidence of the iron by moving a magnet around underneath the paper plate. Slowly moving it around made a few tiny pieces of cereal move around to follow the magnet. Can we make it more obvious? Seeing that bit of cereal move around is somewhat subtle. Unless you’re really looking up close, you might not easily see it. Can we make the motion of the cereal more obvious? We sprinkled a little of the cereal across the top of a shallow bowl full of water. Some of the cereal floated on top. By moving a magnet near the cereal, but not touching the cereal or water, we can make clumps of the cereal move toward the magnet. It is fairly obvious how the clumps of cereal sail across the top of the water! We used D68PC-RB and B666 magnets to demonstrate, plus a dangerously strong DCY0 cylinder. If you use really large magnets like this, be careful handling them! They are not for kids, and can be dangerous if allowed to slam into other objects or magnets. Get the iron out of the cereal so we can see it firsthand. Up to this point, everything we’ve seen is good evidence that there is iron in the cereal, but we have not seen the actual iron. We have seen it attracted to and moved towards a magnet, but the iron remained embedded within the tiny particles of cereal. Now let’s see if we can separate the iron from the cereal using magnets. 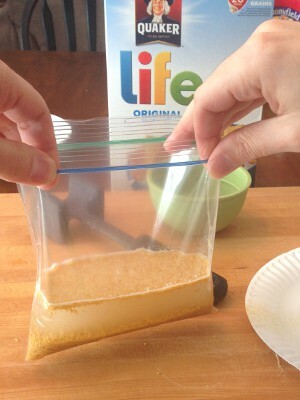 To do this, we put the serving of cereal in a ziplock back along with some water. Let this sit for a while, perhaps 20 minutes or so. This allows the cereal to soften into a soggy mush. After a while, take a strong magnet and move it slowly around the cereal mush from the outside of the bag. We set the magnet on the table and set the bag on top of it, then slushed the mixture around slowly. After a while of this, we found a little bit of black iron dust stuck right to the magnet! In the video below, you can clearly see this bit of iron moving around to stick to the magnet. This is a great science experiment for all ages. Adult supervision recommend with strong magnets!